Enter BootManager – an Xposed framework module that gives you control over every app that is set to auto-start upon boot by the OS. 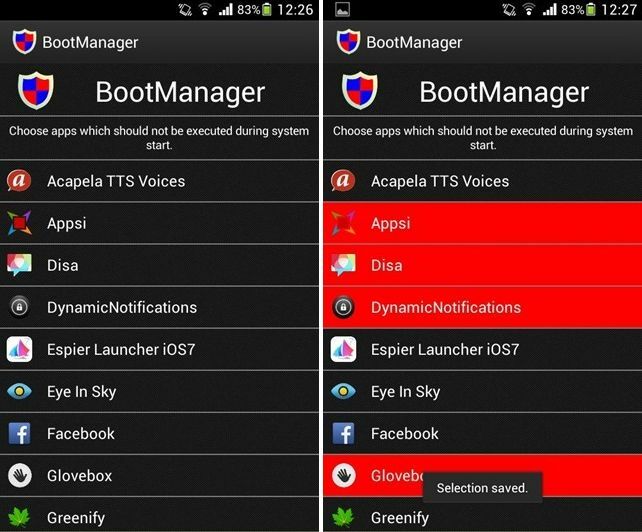 BootManager is a breeze to use even for the most novice of Android users, and all it requires is a rooted device with the Xposed framework installed. More on BootManager and how to use it, after the jump. When you run the app for the first time, it will list down all apps set to run upon every boot of the OS. Do note that the free version of the app does not list or give access to system apps set to boot with device startup; you only get to see and manage user-installed apps that do so. To control such system apps, you will need to make an in-app donation. Tap any app to disable its startup entry; a red highlight tells you that the app has been removed from starting up at boot. While the actual boot time is highly ROM dependent, it is the time the OS takes to settle down after boot up that is most concerning. Personally, I can tell you from my own experience that disabling a few apps using BootManager not just stopped the selected apps from starting up, but also shaved off a few good seconds from the moment the OS booted up until it settled down and was fully ready to be used. For users who still have apps starting up even after disabling them from BootManager, the developer recommends using ReceiverStop – another Xposed framework module.